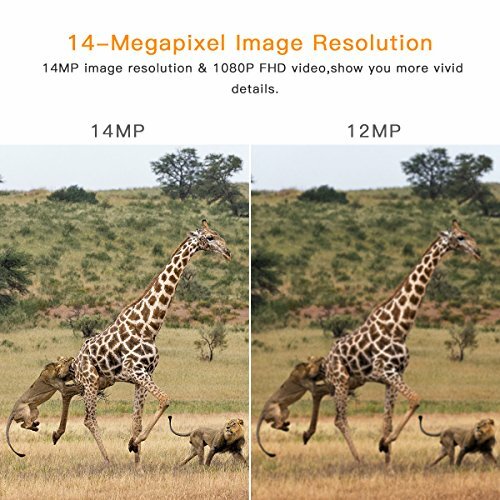 ◀ 14MP Clearer Image + 1080P Sharper Video Resolution ▶The trail camera captures 14 Mega Pixel crystal images and full HD 1080P videos,providing more high-quality details during daytime(black and white at night).You could easily see the vivid world of wildlife. 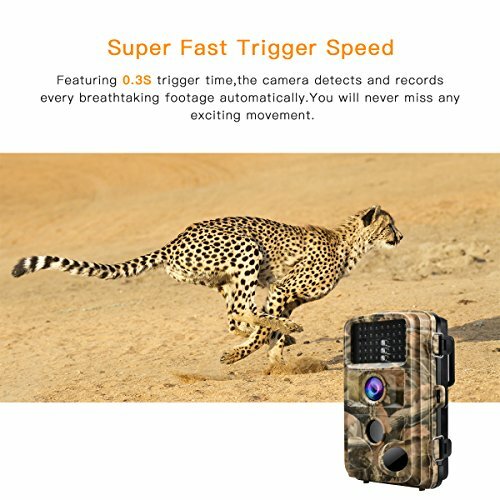 ◀ Faster 0.3s Trigger Speed ▶Once detecting the movements,the hunting camera will be triggered instantly in 0.3s without delay.You will never miss any exciting moments even at night.The trigger distance is up to 20m(65ft). 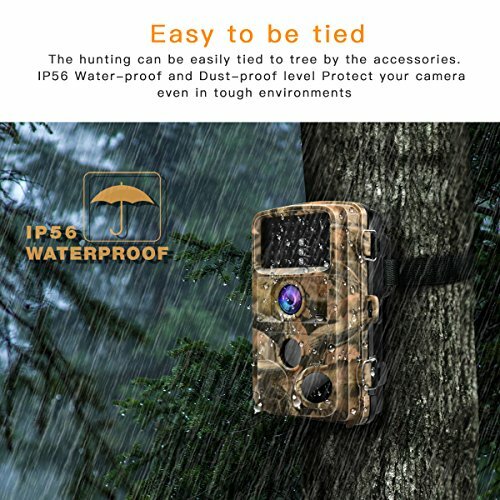 ◀ Excellent Sensitivity and Night Vision with 3 PIR ▶The scouting camera will detect movements of wild animals as soon as they enter the detecting range.With 3 passive infrared sensors,the high-sensitive camera detect and record every breathtaking motion with lower power consumption.The 42 pcs upgraded infrared LEDs without bright flash can let you catch any moment even at dark night.850nm invisible infrared technology support super clear night vision. 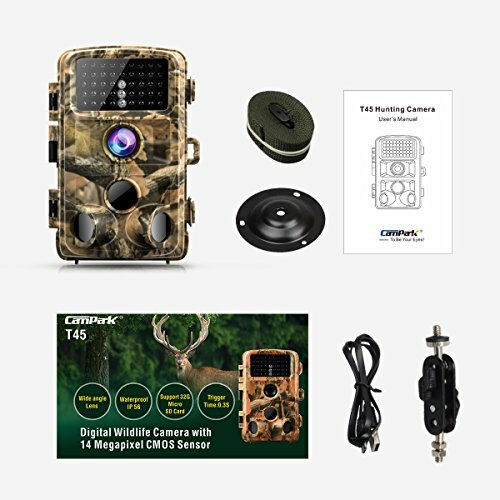 Featuring 14MP and 1080P resolution,the trail camera allows you to enjoy the wonderful natural world. 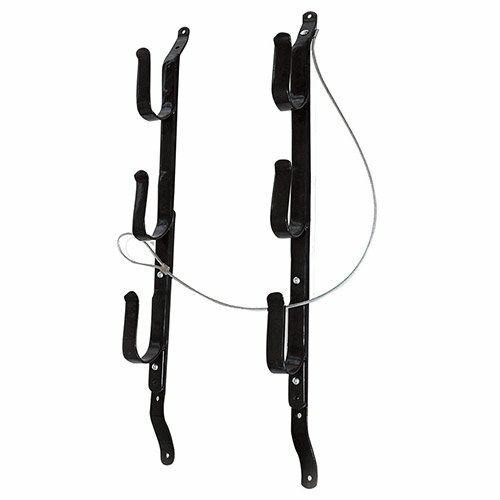 3 passive infrared sensors design can save more battery power while working,and increases sensitivity which makes it triggered in shorter time of 0.3S with longer distance up to 20m. 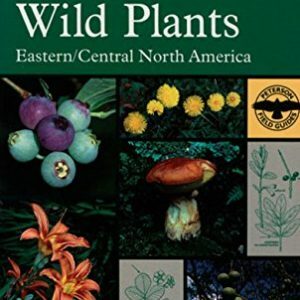 42 Pcs low glow infrared LEDs brings clear view of wildlife at night without bright flash which may scare the animals. The valuable moments of nights will never be missed. 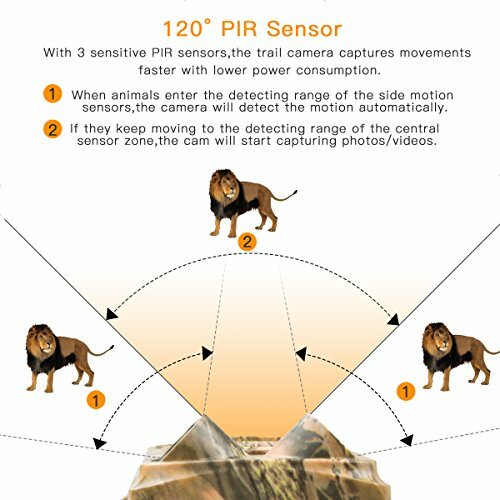 With the features of the hunting camera,it can be applied to other activities except hunting as you wish.You could set the protection password to protect the data in the scouting cam.The operation temperature is -20℃~60℃. 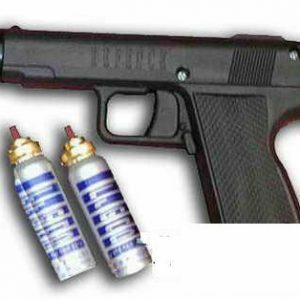 SD card and batteries are not included in the package. Please format the memory card before use. Please remove the protective foil from the camera lens for not affecting the camera effect. 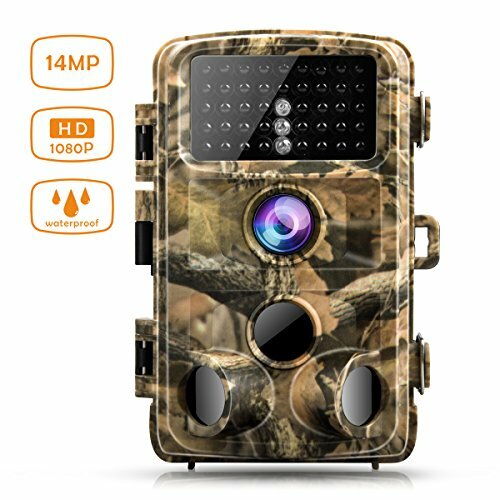 ◀ 14MP Clearer Image + 1080P Sharper Video Resolution ▶The trail camera captures 14MP crystal images and full HD 1080P videos,providing more high-quality details during daytime(black and white at night).You could see the vivid world of wildlife from the 2.4 inch color LCD screen. ◀ Faster 0.3S Trigger Speed ▶Once detecting the movements,the hunting camera will be triggered instantly in 0.3S without delay.You will never miss any exciting moments even at night.The trigger distance is up to 20 m.
◀ Excellent Sensitivity and Night Vision with 3 PIR ▶The scouting camera will detect movements of wild animals as soon as they enter the detecting range.With 3 passive infrared sensors and 42 upgraded infrared LEDs without bright flash,the high-sensitive camera can detect and record any breathtaking motion with lower power consumption. 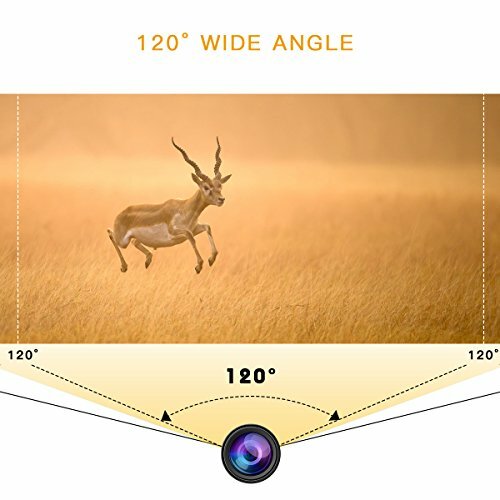 ◀ 120°Wide Angle Lens + Waterproof Sturdy Device ▶The game camera is equipped with 120 degree detecting range,which allows you to get excellent broader view.It will record any animal movements you want with wide angle lens even in rainy days. 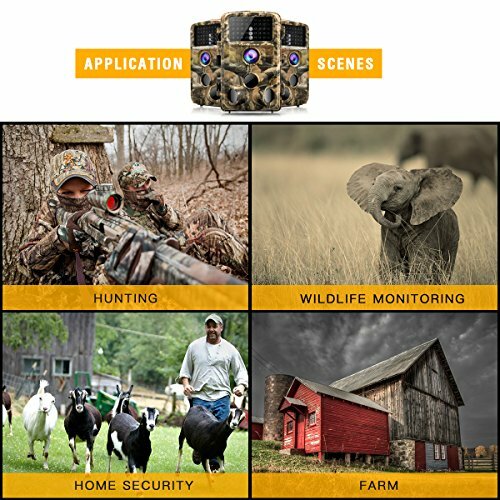 ◀ Easy to Operate + Multiple Applications ▶The hunting cam is easy to operate and mount.You could apply the user-friendly device to outdoor activities,not only hunting but also home security, property surveillance, wildlife monitoring and scouting,Farm Security. 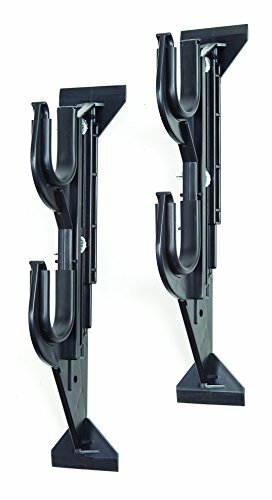 We guarantee 45 days money back and 12-month warranty and professional after-sale service within 24 hours.